Non restrictive design, freedom for the user to experiment without penalty. Easy to deploy a network of workstations in minutes. Extremely fast, restore a 100GB hard drive in seconds. Do not require hidden partitions or special folders, dynamically select the partitions to protect. Flexible restore options, restore on restart, restore on logoff, restore daily, restore weekly or only restore when desired. Easy to update protection, do not need to disable protection to make changes to the system. Simply make changes to the system and then choose to keep. 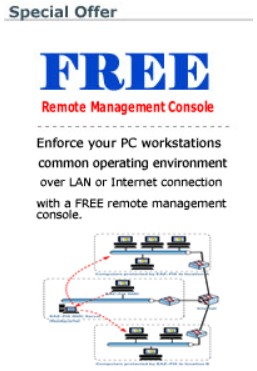 Free remote network management console.